Over the coming years, it is expected that automakers will make significant strides in the area of self-driving cars. Mercedes-Benz, BMW, Volvo, and Tesla, among others, already provide semi-autonomous driving features in modern-day vehicles, but these automakers have their eyes on developing millions of fully autonomous cars within the next decade. Marketing is an experience that is evolving all the time because how people consume and interact with content is always changing. In the past, the majority of information was exchanged through word-of-mouth. It wasn’t until the printing press that people had access to a wide-range of information. During this time, the public also had an increased amount of time to consume their content, so companies need to focus on the best SEO services to drive conversions. Along with this increased amount of time, marketers became savvy and started interjecting their marketing message throughout the content experience. As autonomous cars become a reality, this technology will enable people to consume video content as they drive to and from work. Not only will self-driving cars enable their passengers to relax and not stress about driving, but passengers will also be able to watch T.V. and other interactive content that they can’t consume in today’s driving experience. Not only will autonomous cars help people drive safer, but it will also change how people interact with content. By removing the human driver from the driving part of transportation, autonomous cars will essentially be a mobile living room. In this context, digital media and the marketing campaigns that come with them will transform into an encompassing experience that will extend past the couch and into every minute of the day. Airlines are previously taking the edge of this fact by offering in-flight amusement through private or shared screens playing television shows and movies throughout the flight. It’s a welcomed distraction from your turbulence and vexation that comes with commercial flying. Also, it might function as a solution to solving the public acceptance riddle for autonomous driving. The same experience will be felt by passengers in self-driving vehicles, and just as in-flight entertainment has seen a boost in the experience of fliers drivers will be happier and entertained during their drive. Personalized marketing is one of the cornerstones of today’s marketing campaigns. Gone are the days of general marketing that spams a message across the airwaves. Today, consumers demand personalized messages based on their needs. This is because relevancy means value in the minds of the general consumer, and autonomous cars will provide a valuable outlet for brands to reach their consumers at the time of purchase. The value of marketing messages in autonomous cars will be based on user intent, destination, and other personalized variables. Image the example of someone going to the grocery store for a gallon of milk. Autonomous car technology will be able to communicate with a local database as the passenger presses in the address of their desired grocer. Since the grocery store pays to be part of a larger marketing network, they can deliver personalized messaging about that day’s specials and other incentives to the driver as they travel to the store. All this messaging will happen in real-time, and the message will be a customized experience based on the purchasing habits, desired destination, and other elements that are relevant to the buyer’s journey. Here are some of the ways that marketers and brands will leverage self-driving cars as a platform to deliver personalized messages to occupants. Targeting by location. It’s crucial to integrate the physical and the electronic for customers on the move. Self-driving cars provide the opportunity brands need to increase spend and raise awareness. Since viewers will be traveling to a physical location, it can be assumed their intent is to purchase something. Personalized by consumer choice. The ads the passenger should be shown based on the individual’s purchase history and other variables. While current-day GPS programs like Waze use this to an extent, autonomous cars will provide an unprecedented level of access and content consumption since passengers will be fully immersed in the onboard delivery system. Happening in real time. Autonomous cars will be the next evolution of the modern-day billboard. Smart marketers of the future will utilize onboard information systems to entertain and engage their customers with personalized content. Passengers will receive customized messages based on their current location and destination. In-vehicle advertisements will need to be relevant and valuable if consumers will take action, so dynamic content will rule the self-driving cabin of tomorrow. As apps and other systems continue to be developed to help consumers in their daily lives, marketers will continue to find ways to deliver relevant content and a particular marketing message to their audience. Autonomous cars are no different, and these self-driving machines will help brands provide valuable content to their viewers. 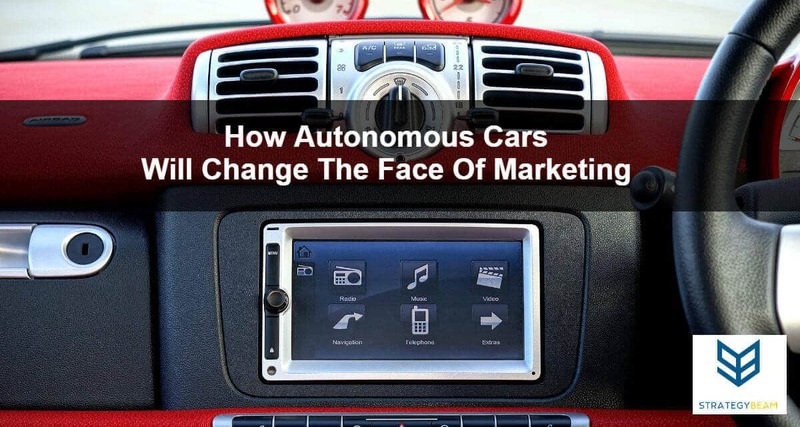 Autonomous cars will be a vital piece to a company’s overall Internet marketing strategy in the coming years!